NEW YORK ― Seoul City on Monday was recognized for its efforts to evolve into an energy-independent city at the C40 & Siemens City Climate Leadership Awards held in New York City this week. “Seoul’s efforts to transform into an energy-independent community can be an example for other cities. It was willing to significantly improve its environmental performance and radically change its energy mix,” said Daryl Dulaney, president and CEO of Siemens Industry. The C40 & Siemens City Climate Leadership Awards was created in 2013 to honor cities all over the world for their work and initiatives to achieve urban sustainability and fight climate change. Seoul won the award in the green energy category for a project called “Make Seoul a City of Sunlight,” which was devised to reduce greenhouse emissions and expand renewable energy generation by building more photovoltaic facilities. Under the initiative led by Seoul Mayor Park Won-soon, the city generated cleaner renewable energy by utilizing idle spaces at city-owned public buildings, such as rooftops. “This project is the single most important strategy for turning Seoul into a sustainable city, and for handing down a healthy and safe environment to future generations,” he told The Korea Herald after receiving the award. He also talked of his energy initiatives, stressing that he had promised to turn Seoul into an energy-independent city at the time of his mayoral inauguration in 2011. “Since then, we have reduced the city’s energy use by 2 million tons of oil, which is equivalent to the power output at a nuclear power plant,” Park said in a speech at the ceremony. Seoul is currently asking more citizens to take part in installing miniphotovoltaic power stations on the rooftops of school buildings, apartments and other structures ― a move that takes advantage of the high building density of the city. Nine cities received prizes in 10 categories, including London, which won an award for carbon measurement and planning and another for air quality. Spain’s Barcelona and China’s Shenzhen were honored in the categories of intelligent city infrastructure and urban transportation, respectively. “I commend the winning cities for their leadership and commitment and am confident that their knowledge and experience will help drive other cities to implement on-the-ground solutions faster and more efficiently. Through cooperation and collaboration, cities continue to deliver the results that are having a global impact,” said C40 Chair and Rio de Janeiro Mayor Eduardo Paes. 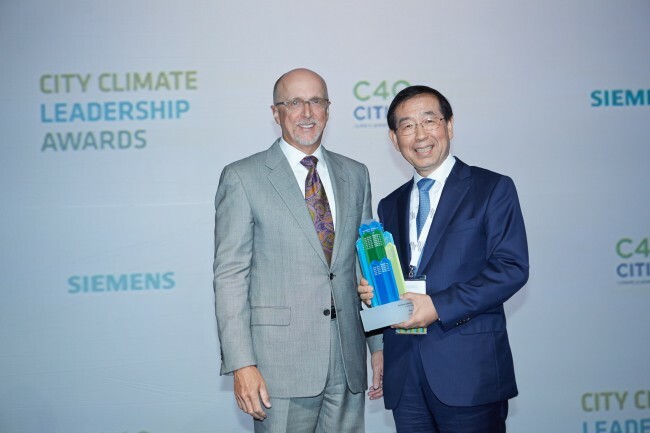 This is the second time that the German engineering giant Siemens has collaborated on the City Climate Leadership Award with the C40 Cities Climate Leadership Group. The ceremony also featured C40 board president Michael R. Bloomberg, New York Mayor Bill de Blasio, former Norwegian Prime Minister Gro Harlem Brundtland and over 250 policymakers, experts and influential thinkers from around the world, the award organizers said.